“I’m all for a prequel myself after seeing myself CGI-ed in the beginning of the movie, 30 years younger, which was incredible”. Oscar-winning actor Michael Douglas made the European premiere of Ant-Man a family affair as he brought his wife and children back to London. 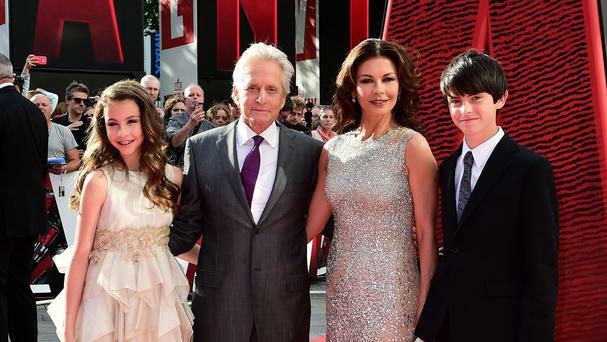 The 70-year-old star, who plays scientist Dr Hank Pym in the Marvel movie, was joined by Welsh actress Catherine Zeta-Jones, 45, and their two children – 14-year-old Dylan and Carys, 12 – on the ant-printed red carpet outside the Odeon Leicester Square cinema. Leading man Paul Rudd, who plays the titular superhero, Michael Pena and director Peyton Reed also attended the premiere, alongside celebrity guests Jeremy Irvine, Inbetweeners star Blake Harrison and Game Of Thrones actor Isaac Hempstead-Wright. The star of films such as Wall Street, Romancing The Stone and Basic Instinct revealed his son persuaded him to take the role. “When my 14-year-old saw this script, he looked at me and said: “Dad, you’ve got to do this film. This is a whole new audience for you’, and I told him he should be my agent,” he recalled. Douglas, who threw a few punches as Hank, said he enjoyed the action scenes. He is hoping this will lead to more action roles. He joked: “I’m all for a prequel myself after seeing myself CGI-ed in the beginning of the movie, 30 years younger, which was incredible. Rudd, best known for starring in comedies including Anchorman, Knocked Up and Clueless, praised his co-star and screen mentor. “Michael brings legitimacy and gravitas. I would have flashbacks of him in other movies halfway through filming scenes,” he said. Rudd, who worked out and went on a diet for a year, said he even enjoyed wearing the superhero’s skintight costume. “I think it’s the coolest superhero costume, but I’m biased,” he said. Evangeline Lilly, who plays Hank’s daughter Hope, was unable to attend the premiere as she is eight months pregnant.